Here's a quick rainy day project I did for S, who loves a game called Minecraft. 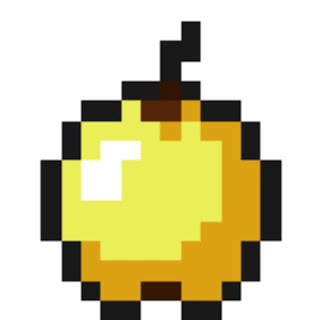 We were looking at objects in the game and came across the Golden Apple. S remarked that it was a very rare but good find, as it restores all your health. Doesn't that sound like something from a fairy tale? Find the Golden Apple, and all will be restored! 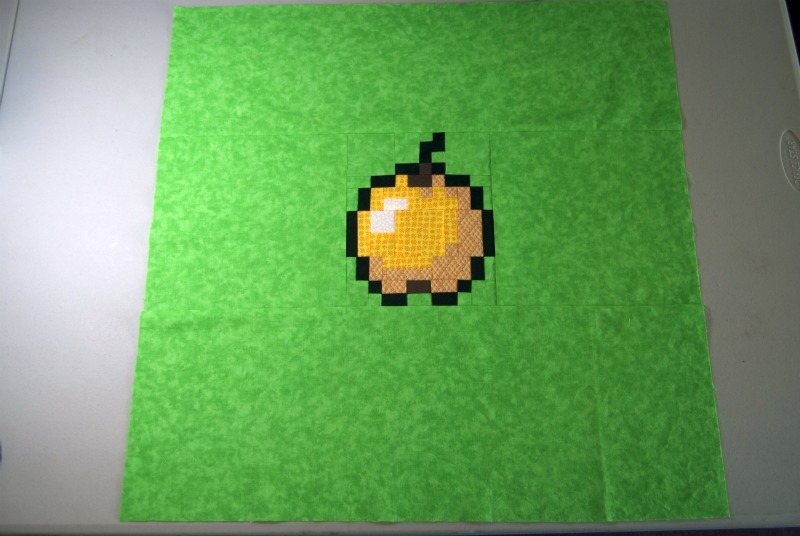 I envisioned a little quilt block in the shape of a Golden Apple, something an ailing child could lie upon to feel better. 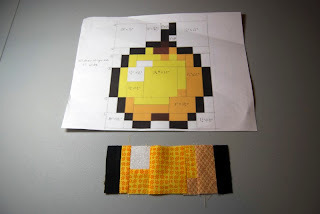 I thought this project might be useful to someone else who might also want to create a quilt block from a simple, pixelated icon. 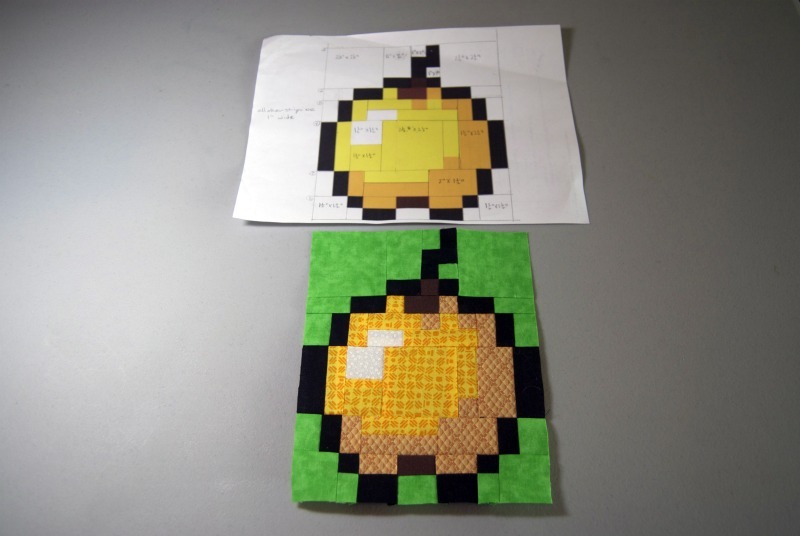 So here's how the Golden Apple was pieced. For a block in the 6-8" range, the basic unit would be 1/2" square. 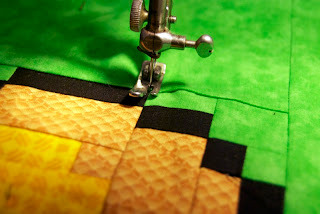 Since quilting has 1/4" seams, we need to add 1/2" to every finished dimension. In other words, a 4-block piece would measure 1" square in the quilt, but would need to be cut at 1-1/2" in order to have 1/4" seams on every side. This is how I diagrammed it. (Sorry about the sloppiness and water drops. It wasn't my intention to blog this when I started.) 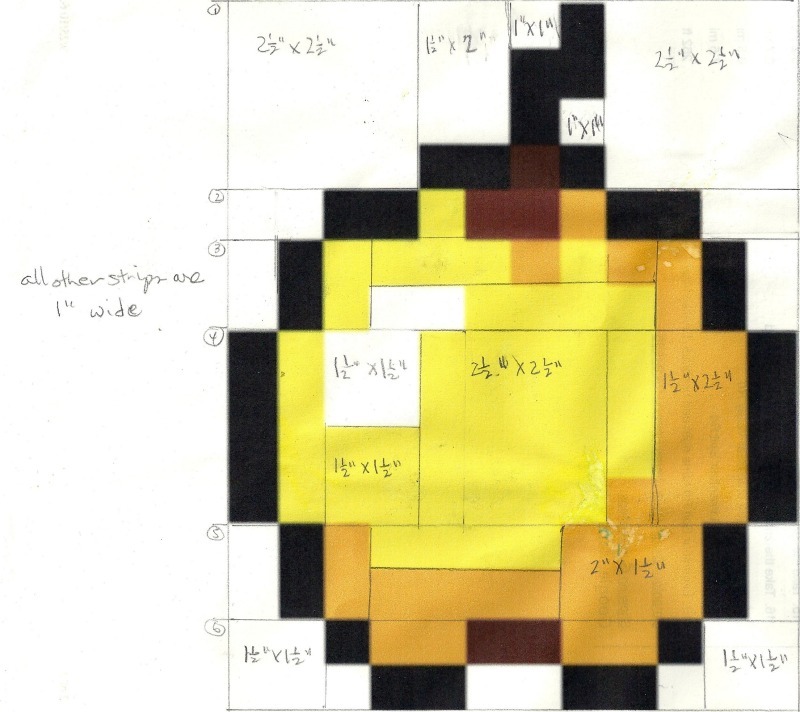 The block is divided into 6 rows, each row the height of its largest component. I changed how I pieced it as I went along. All that really matters is that it be divided into rows which are sewn together afterwards. 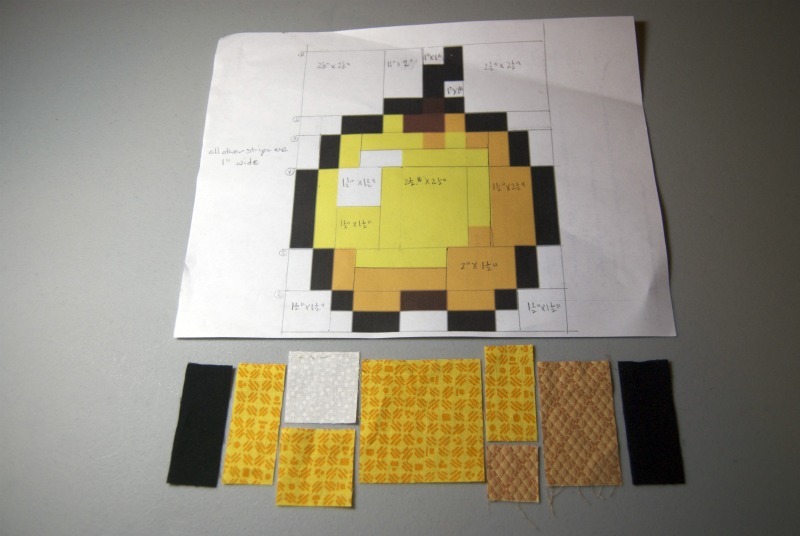 Here is an example of how Row 4 would be cut and pieced. Notice how much it has shrunk in width. 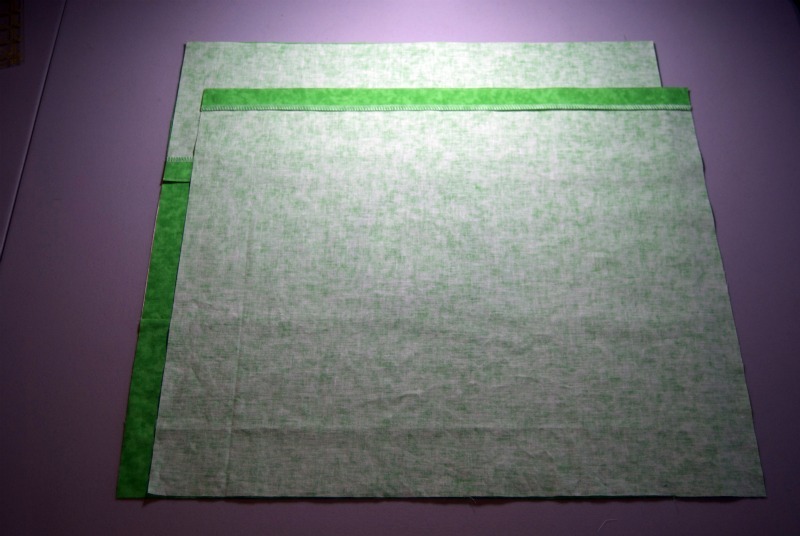 Six seams means it was diminished by 3" (1/4" on each fabric edge, or 1/2" per seam). 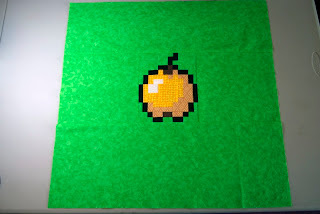 With each row in place, it soon looked like an apple, albeit a little elongated due to seam allowances not yet sewn. Having those narrow 1/4" seams rubbing against the pillow made me a little uneasy, so I cut a backing of muslin to the size of the pillow front and machine quilted around the black outline. You could put a piece of thin batting in between the pillow front and the backing. 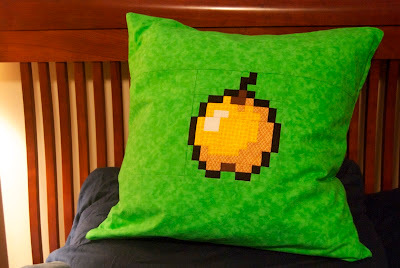 You could also quilt inside the apple. But without some quilting, it's likely to fall apart over the course of several washings. 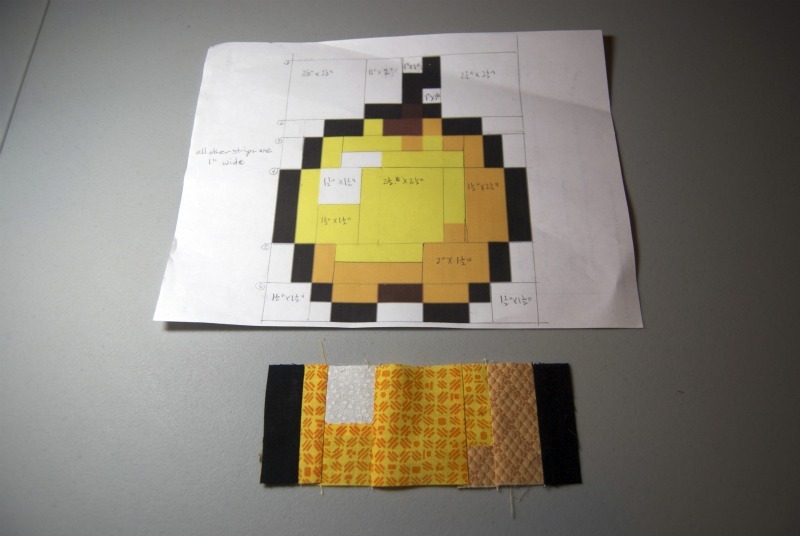 This is how you lay the pieces for a simple envelope opening. 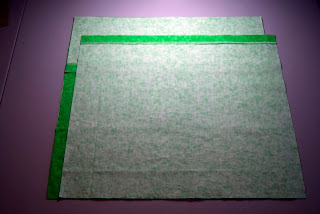 The outside/top flap will go on first, and the inside/lower flap goes on next, both of them with right sides facing down toward the right side of the pillow top. I've offset the inside/lower flap a little to the right so that the order is more visible. 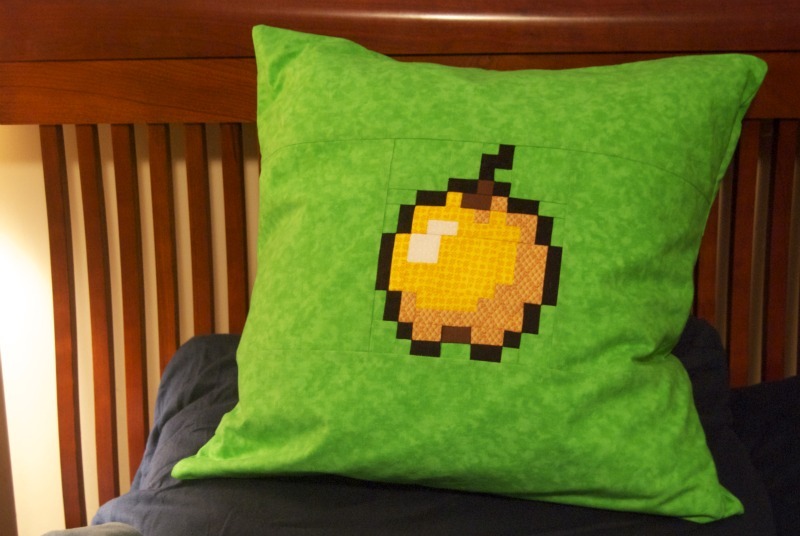 A quick stitch around the entire perimeter, turn it right side out, and it can be filled with an inexpensive pillow form from Ikea. 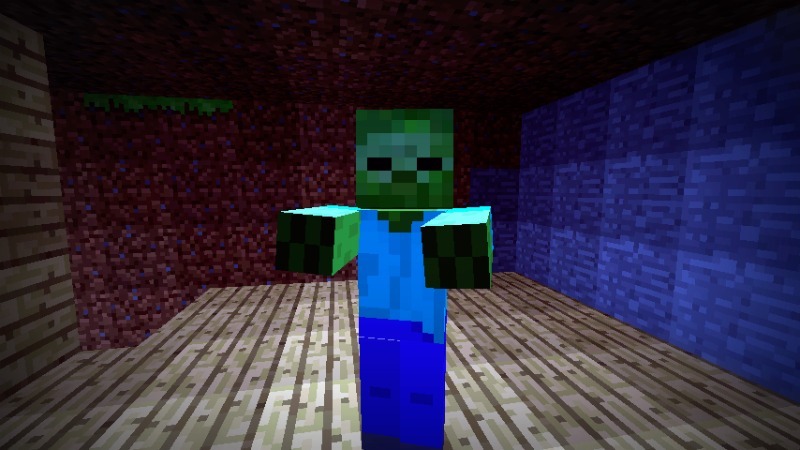 S can now use it in event of the zombie apocalypse. This is really just so cool! Thanks for stopping by, Norman. I'm looking forward to watching your blog develop--sounds like you have a lot of varied interests that would make for some great posts. Very cute! 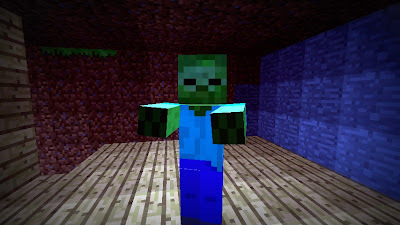 My kids have discovered minecraft too. What's a mother to do? Quilt it!! Thanks for sharing!